I promised not to write about John McCain but I found someone that seems to have a some interesting thoughts on the guy. Who Was the Real John McCain? I’m not sure what to believe about John Sidney McCain III. He has the most ferocious detractors, who accuse him of informing on fellow captives in a North Vietnamese prison, and betraying critical military information that enabled the enemy to shoot down more U.S. aviators. His accusers range from obvious flakes to some people who appear pretty credible to me. But he has credible die-hard defenders, too, who insist that he conducted himself honorably under the most extreme conditions. All we know for sure is that he went into harm’s way in his country’s service, was held in captivity for five years and came home in great pain, unable to comb his own hair. Like most Americans, I’m inclined to give a banged-up ex-POW the benefit of the doubt. But McCain himself was not so generous toward POW/MIA activists, whom he ridiculed as “hoaxers” and “charlatans.” I have no firm opinion whether we left a significant number of soldiers and Marines behind in Vietnam. I don’t pretend to know. But if the government sent one of my loved ones off to war and he or she never came back, I think we would be entitled to the utmost transparency. At last count, there are 1,597 unexplained missing. The government is accountable for each citizen it sent into harm’s way. The senator reportedly was hostile to transparency in the Vietnamese government, as well. U.S. files about the extent of POW collaboration and cooperation with the enemy remain airtight (classified), but the North Vietnamese kept records, too. Some were reportedly archived at a museum there. 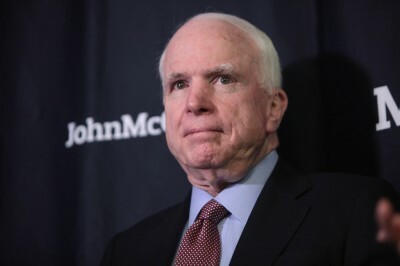 Fellow U.S. delegates who visited Vietnam with Sen. McCain said he became visibly agitated on the subject, and warned their Vietnamese counterparts that Vietnam would never get diplomatic recognition if it released those records, which included his own. Without trying to guess McCain’s motives, it’s obvious that he considered government service a personal domain in which he was free to move the chess pieces around without any particular accountability to the pawns. He once ditched a plane and bailed out while returning to Norfolk after the Army-Navy football game in Philadelphia. He said the engine quit. He lost a plane in the water during training because, he said, that engine quit, too. When the Navy recovered the plane, the engine fired right up but the admiral’s son continued the course in a new plane. The fact-checking websites have lined up to absolve McCain of responsibility for the catastrophic U.S.S. Forrestal fire in 1967 that killed 134 and injured 161 crew on the aircraft carrier. But it’s still controversial among fellow sailors who said he was notorious for “wet starts” that produced a flare to startle the pilots behind him on the flight deck. He was immediately transferred off the stricken ship after the disaster, to a public relations position in Saigon, far from embittered crewmates. But it matters if he has lied to us or let his supporters lie to us in order to shame us into acquiescing in his politics, or discouraging us from exercising our best judgment. We’ll never really know whether the North Vietnamese tortured Lt. Cdr. McCain, partly because Sen. McCain used his political power to ensure that the relevant records are unavailable to us. On this subject and others, the senator strongly preferred that we just take his word for it.